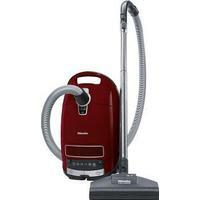 Powerful, quiet and effective - great value for money from Germany's Miele. German brand Miele produces a wide range of top-notch vacuum cleaners, with a variety of purpose-built models for everything from hardwood floors to allergy sufferers. As its name suggests, the upright Miele Complete C3 Cat Dog PowerLine was created with pet owners in mind. With its curvaceous compact form and classy red finish, it’s particularly easy on the eye, and combines serious cleaning power with user-friendly features. While it may look elegant, the C3 PowerLine packs quite a punch. The cylinder vacuum cleaner boasts 1,200 watts of strong suction, ensuring a tight seal between the floor and cleaner head, maximizing its dust-busting effectiveness. Despite its power, it’s surprisingly quiet thanks to a reduced-noise motor and sound insulation – ideal if your dog isn’t the biggest fan of noisy vacuum cleaners. It’s also extremely easy to use. As well as being very mobile, its extension cable provides an extremely large operating radius, meaning you won’t have to keep changing sockets as you vacuum from room to room. It can be rewound with a foot control, while the machine itself can also be turned off when you hook you the floor head onto its rear – making stooping a thing of the past. Whether you’ve got a deep pile carpet or fabric upholstery, anyone with a cat or a dog will know that vacuuming becomes an altogether more arduous task. Fortunately the C3 PowerLine boasts a turbobrush to make light work of pet hair, and also features a filter system that neutralizes nasty pet odours. The filter itself is a clever bit of kit, and comprises of three different components. There’s the Miele HyClean dust bag, a motor protection filter, and an exhaust filter. Each work with one another to ensure that even the tiniest specs of dust are caught, filtered, and collected – making the air in your home healthier in the process. If there’s one thing that defines all Miele vacuum cleaners, it’s user-friendliness. As such you can anticipate plenty of in-the-box attachments to use with your C3 PowerLine, whether you need the intense power of the turbobrush, or something more tactile for delicate tasks. They include a crevice nozzle for getting into nooks and crannies, an upholstery nozzle for your furniture, and a soft-bristled dusting brush – ideal for shelves or door frames. Each attachment is top quality, and clips in and out of the C3 PowerLine’s adjustable telescopic tube with ease. Why you should buy it: As the name suggests, this is particularly good on pet hairs, so ideal for allergy sufferers. It's powerful, effective and quiet, and not a bad price, really.